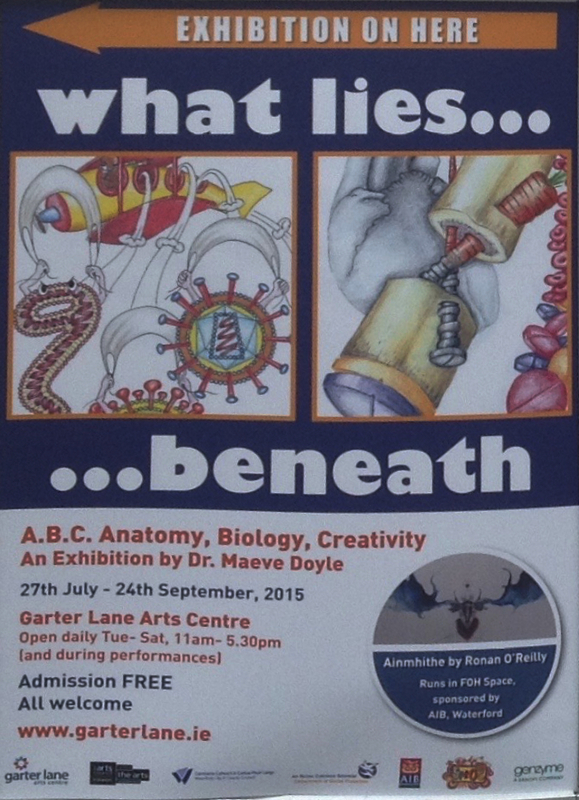 ‘What Lies Beneath’ by Dr Maeve Doyle held at ‘Garter Lane Gallery’ Waterford is an exhibition of anatomically accurate images which are adapted and altered slightly to convey a message – Anatomy with a twist, with an injection of life and fun. Many of the drawings are from the collection of work she did for Modern Medicine Ireland, for which she created illustrations, over a period of ten years. The exhibition ‘What Lies Beneath’ is running until 24th September 2015. 15 – Heart – Ashtray, 29cm x 19cm, NFS. The image is a cross-section of the heart drawn as an ash-tray. The ‘heart’ is sitting on a green surgical drape, with a surgical instrument holding an artery. The image represents the effect of tobacco on the cardiovascular system (heart, veins, arteries) and the consequences of smoking. Her illustrations ‘tell a story’ or ‘convey a message’ e.g. 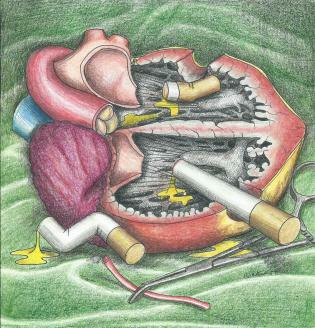 in the image of a heart, a cross-section is portrayed as an ash-tray to demonstrate the link between smoking and heart disease. They are also used as teaching aids and for e-learning programmes. 20 – Bone Fracture Healing, 29cm x 21cm, NFS. The image is a schematic representation of a bone ‘fixated’ with a screw and incorporates elements that affect fracture healing including nutrition, fixation, blood supply, medication. ‌The artist enjoys drawing anatomically accurate images which are adapted/altered slightly to convey a message. The drawings show ‘what lies beneath’ both in anatomical terms and when there is a disease process occurring. 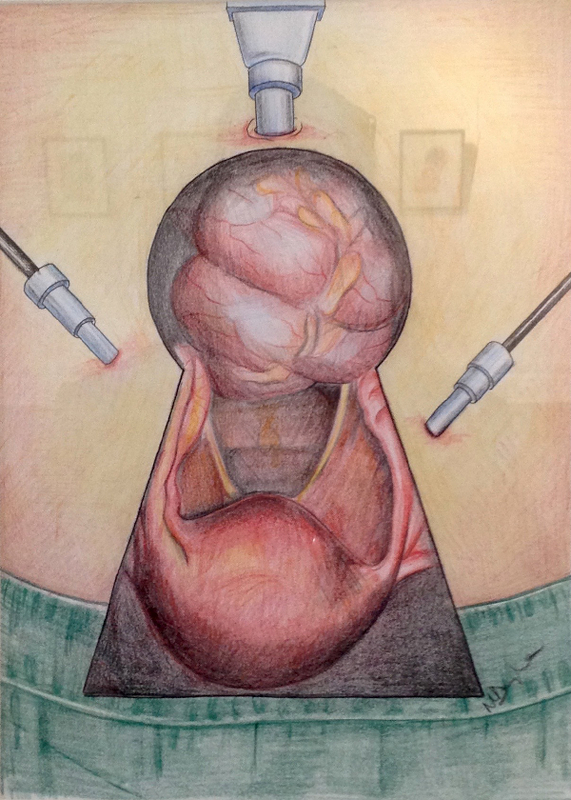 25 – Keyhole Surgery, 29cm x 20.5cm, NFS. Image of gynaecological laparoscopy, commonly referred to as ‘keyhole surgery’. The image shows the abdomen with laparoscopic ports and a green surgical drape. The image ‘through the keyhole’ depicts the contents of the pelvis. Dr Maeve is a visual learner and believes in the power of the visual aid. In medical school, trainee doctors learn ‘lists’ of factors affecting disease. In her work, the artist tries to turn the ‘list’ into an image e.g. 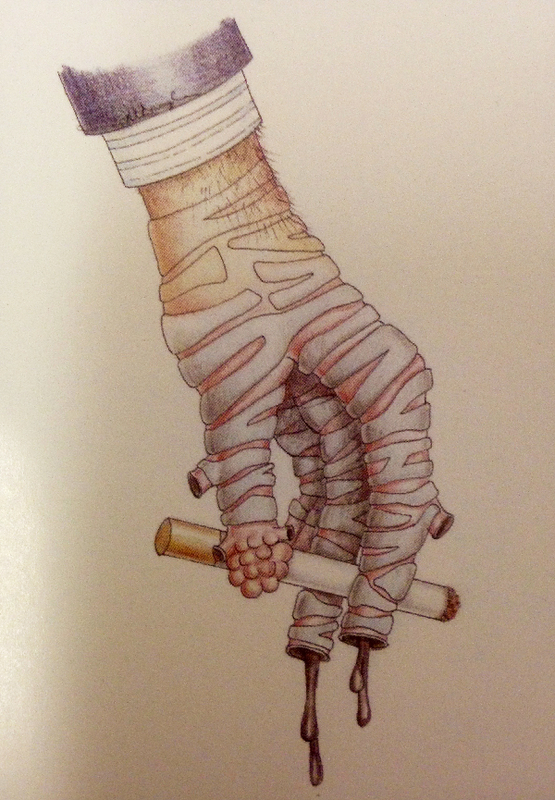 in the image of the fractured bone, the artist’s ‘twist on anatomy’ is used to illustrate the factors that affect fracture healing. 38 – Bowel Diet, 29cm x 20cm, NFS. 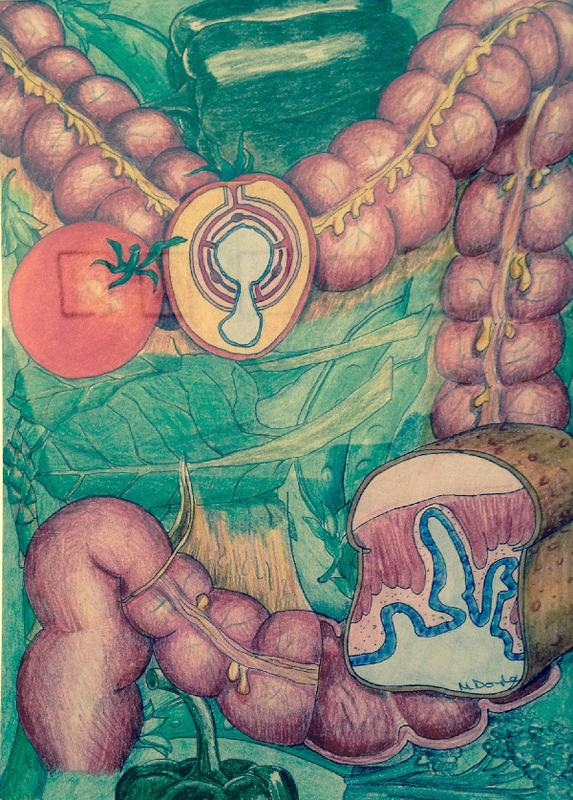 The image is a drawing of a portion of the large bowel with high fibre food in the background. The cross-section of the loaf of bread and tomato illustrate the diverticuli (small pouches) found in the lumen (inside) of the bowel. The artist draws people, portraits and caricatures too. In her caricatures, Maeve tries to incorporate things that represent ‘What Lies Beneath’. In the image of the Microbiologist in the laboratory, for example, ‘What Lies Beneath’ is a love of shoes, an interest in antique furniture and a high coffee consumption! 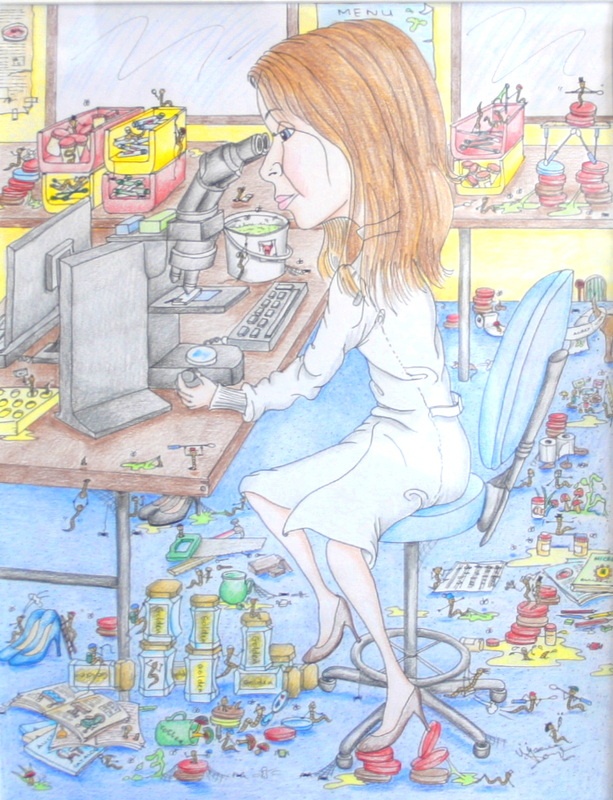 In the caricature, the artist also includes a separate frivolous ‘worm world’ in the background, just for fun (this of course, is artistic licence and a stark contrast to the reality of the usual Microbiology laboratory!). 14 – Smoking – Hand/Bronchus, 23cm x 21cm, NFS. In this image the fingers of the hand holding the cigarette have been drawn with cartilage rings to give the appearance of the anatomy of the bronchi (branches) in the lung. The exhibition also includes black and white drawings illustrating surgical anatomy and surgical technique. Many of these drawings were requested by colleagues and were used as teaching aids. Her illustrations have also been used for the RCSI e-learning programme, ‘BeST online’. 23 – Sinusitis, 21cm x 21cm, NFS. 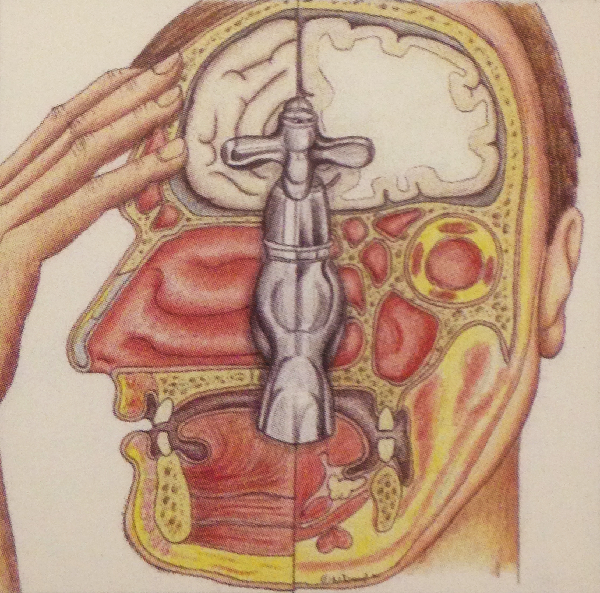 The image shows the sinus cavities (in the skull) both in coronal and sagittal (vertical) sections with a superimposed ‘tap’ to represent the ‘post-nasal drip’ that is responsible for some of the symptoms of sinusitis. Her illustrations have also been used for patient information leaflets for the Vascular Department in University Hospital Limerick and the Cardiology Department, St James’s Hospital, Dublin and in the book ‘A Practical Guide to Echocardiology’ (Asmi MH and Walsh M, Chapman and Hall Medical, 1995). The influence of artist’s work in Microbiology can be seen in the images depicting viruses and hand hygiene. The image of an aeroplane with three viruses exiting the craft is very apt today. On the cover of Modern Medicine, November 2004 for example, the ‘shepherd’s crook-shaped’ virus on the left represents Ebola! Dr. Doyle is a medical graduate of Trinity College Dublin. After her internship, she worked as an anatomy demonstrator in Trinity College, and then completed Basic Specialist Training in Surgery on the Dublin Surgical Training Scheme. Currently a Consultant Microbiologist in University Hospital Waterford and St Lukes General Hospital, Kilkenny. She is a senior clinical lecturer for UCC and also lectures on the Orthopaedic teaching programme for RCSI. Everybody’s got a body and ‘What Lies Beneath’ is an exhibition that has an appeal for everyone. A touch of Guts and Gory. Grotesque & cute caricatures also the A • B • C •’s of Anatomy • Biology • Creativity. Some medical home truths shared in a humorous manner. An enlightening simplicity of some health conditions & of course worms. The devils in the detail. The subject matter is brought to life in this series of detailed pen & ink drawings accompanied by a selection of colour pencil representations. Definitely and exhibition for all ages. Of course! if you’re around Waterford City between now and the 24th of September, 2015 Do pop-in, in-Person. Admission is Free. 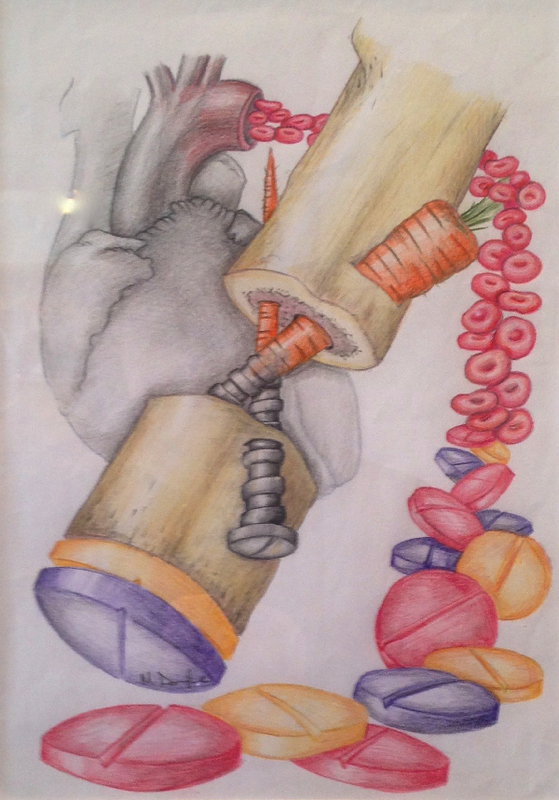 ** ‘What Lies Beneath’ – is Dr Maeve M. Doyle’s exhibition of her medical illustrations and drawings. ‘What Lies Beneath’ was previously on public display during her first solo exhibition, at the Jennings Gallery, University College Cork, 11 Dec 2014 – 29 Jan 2015. •• Most of the copy used in this article was compiled from the selection of previously published ‘What Lies Beneath’ exhibition promotional sources.